This is an original RCA 6SH7 Radiotron Sharp-Cutoff Pentode Metal electron tube. A classic collector's special metal vacuum tube. 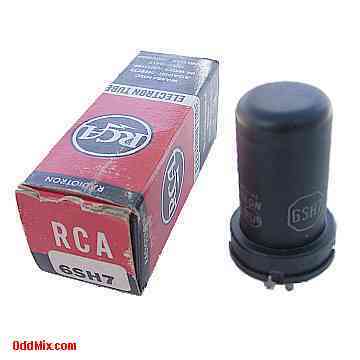 The tube is so old as the 1964 "RCA Receiving Tube Manual" listed it as obsolete. The tube's recommended application is listed as a Class-A amplifier. Excellent for those antique radio or television restoration projects or to set up a private vacuum tube museum. It is a NOS tube - New Old Stock, unused, boxed, excellent condition. First come first serve, as only one of this rare historical vacuum tube available!